Though purists will find Return to Forever's This Is Jazz, Vol.12 frustratingly incomplete, it isn't designed for them. The entire This is Jazz series is targeted at casual fans and neophytes, who only want a sampling of a famous jazz artist. In that sense, this disc does its job quite well, displaying nearly every aspect of the group's adventurous jazz fusion, including collaboratins with Al DiMeola, Stanley Clarke and Joe Farrell. 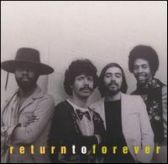 Of course, this only gives a general idea of what Chick Corea accomplished with Return to Forever, but it's enough to spark the interest of anyone wanting to explore the group's catalog.